The drought is rooted in a dry spell that began in October and is considered "extreme" from southern California to central Kansas. Conditions are even worse in the Four Corners region and the Oklahoma and Texas panhandles, warranting their description as "exceptional." 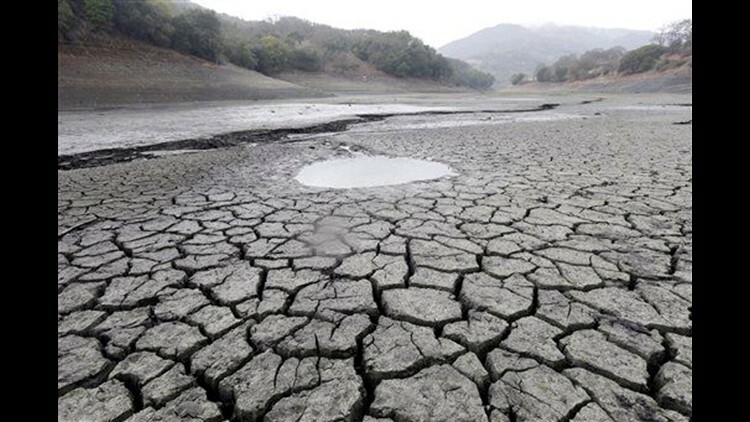 "The proverbial spigot shut off," said Brian Fuchs, a climatologist at the National Drought Mitigation Center at the University of Nebraska in Lincoln. "Drought isn't necessarily a signal for wildfires, but it can exacerbate the conditions that do take place." Climatologists consider the months from October to April to be a "recharge" period, with showers and snow replenishing water supplies in the Southern Plains. However, the most recent significant rain in the area came in early October. "The memory of that precipitation has long went out the back door," Fuchs said. Temperatures have largely been above normal over the same period, triggering evaporation that can carry a lot of moisture away before it has a chance to soak into the ground. There is very little snowpack remaining except on the highest peaks. "Even normal precipitation ... would be helpful," Fuchs said. The dry air has likely contributed to some weather anomalies: Several towns in western Oklahoma have seen wild temperature swings, and Oklahoma hasn't had a tornado yet this year, though a later start to the tornado season doesn't mean it could be any less troublesome. "It just takes one tornado to have a disastrous year," said Todd Lindley, the science and operations officer at the National Weather Service office in Norman, Oklahoma. Gary McManus, Oklahoma's state climatologist, said the low temperature recorded at a station at Alva on April 17 was 33 degrees — with frost in the area. Hours later, the same station recorded a high of 101. Similar temperature swings were recorded in the Oklahoma Panhandle and could be attributed to the dry air, not any of the station's proximity to wildfires. "We are very desert-like," he said.